The modern model for successful marketing requires that you be present and active via all available communication channels while maintaining close, highly personal relationships with your customers and prospects. Add the requirement for top-quality marketing content, and you’ve got a challenge many fail to meet for a simple reason: lack of time and technology. 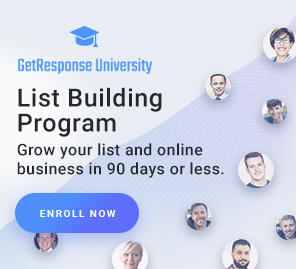 If you haven’t included a GetResponse sign up form on your Facebook fan pages yet, you may be missing out on tons of opportunities to add new subscribers. Here are some helpful reminders, taken from the most frequently asked questions of our users. Our answers will help you set up your sign-up form just right. We know many of you are using GetResponse web form builder to effectively manage sign ups on your websites. To help you with some frequently asked questions, here’s a short post on the most common issues you might experience and how to easily solve them. Here at GetResponse, we recently launched our advanced segmentation feature, and we already have the use of personalization and dynamic content. So we encourage you to gather as much data as you can on your clients, so you can have the ability to ‘Market to One’. But is there such a thing as too much data?